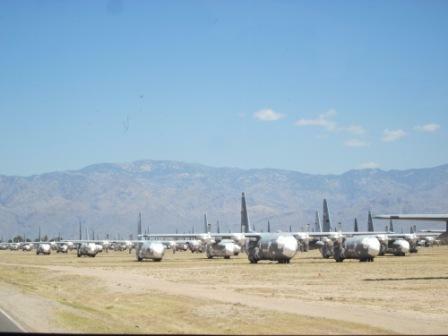 The US Air Force’s 309th Aerospace Maintenance and Regeneration Group (AMARG), known as “The Boneyard”, is one of the places that I had wanted to visit since many years ago. Luca and I visited it a couple of weeks ago. The Boneyard is an aircraft and equipment storage facility located at Davis-Monthan AF Base near Tucson (Arizona). The are over 4,000 military aircraft stored at the place. Most of them come from the USA (not only from the air force, but from other services as well) but there are some aircraft from foreign countries. The aircraft are stored for several reasons and in different conditions. Some of them are maintained waiting for a possible future use of them (be it with US armed forces or through some foreign military sale, that is the case of several old versions of C-130, F-16). Other aircraft are kept so their parts can be used as spare parts for other active flying aircraft (e.g. C-130, KC-135). 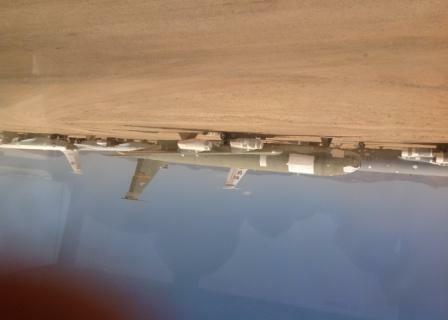 Finally, there are aircraft which are stored waiting to be scrapped so the metal can be reused somewhere else. The Boneyard can be visited with a guided tour organised by the Pima Air and Space Museum (I will write about this museum in another post). The tour is made with a bus which goes through the Boneyard very slowly and making several stops (though guests cannot exit the bus). The guides are veterans from the US armed forces, who have flown or maintained some of those models that you get to see. The wealth of knowledge that they have about them, the anecdotes and stories that they tell during the tour are worth much more than the 7$ that the tour costs. World commercial airliner fleet (over 100 pax) has about 16,000 aircraft vs. the 4,000 at The Boneyard. The largest airline fleets have about 1,200 aircraft. Spanish AF has 14 C-130 Hercules vs. the hundreds of them you see at The Boneyard.